Let’s face it, when you’re at the beach sometimes you get sick of sea food. If you’re at that point, the Fire Wok is the perfect place to go. The service is great, and the food is yummy! The best thing? The place is super cheap compared to other restaurants in the area. In true Chinese take-out fashion, expect to get large portions! 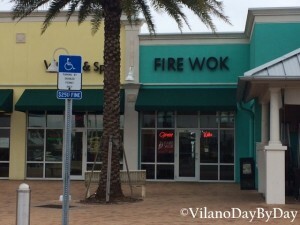 The Fire Wok can be found next to Publix. + Pros: Quick, yummy meals that are cheaply priced! The staff is great, and it’s obvious they not only care about their business, but want the costumer to be happy. They deliver, and you can even order online. – Cons: It can take a while to get your order, especially if you’re a walk-in, so its best to call in ahead of time. Seating inside is very limited!